Our Just Food event went really well. The speakers were fantastic, the food was wonderful and the movie was great. My good friend, Esperanza, was one of the speakers. Her talk was about her life and the struggles she faced growing up and then her discovery that she could connect with her ancestors through producing food. She had a funny anecdote about her first experience growing broccoli and how, even though she was a smart, educated woman, she was so disconnected from her food that she couldn’t figure out when to harvest it. Today she can laugh about it but it really did make one think about food and how most of us just don’t know as much about food as we think we do. I was fortunate that my grandfather taught me about gardening when I had fewer years under my belt than fingers on one hand. even though I had early childhood education in growing food it wasn’t until I was out of college that I had seen how Brussels sprouts grew, so I can kind of understand where Esperanza was coming from. The problem goes deeper than what a broccoli head or stalk of Brussels sprouts looks like though. There are a lot of people, it seems, that don’t even know what a chicken looks like. Joel Salatin mentions in Folks, This Ain’t Normal how he runs into people all the time that don’t realize chickens have bones because they always buy boneless, skinless hunks of chicken meat. The microwave is the only used appliance in the kitchen, if they even have a kitchen. You can have money, and be educated but you can still be food insecure because you don’t know how to feed yourself, or even use foods appropriately. 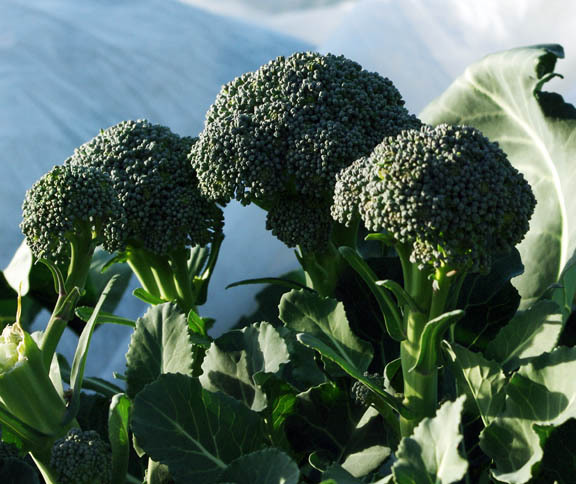 I grew up with farming/gardening and I had a little trouble with the broccoli too! I didn’t realize there were different types. I kept waiting for a larger head and it went to seed on me! I did learn that here in the south, I must get it out there very early. It was one of our “let’s try it” crops and we only planted 3 plants so it wasn’t a big loss.